At the time this was sent to me, I don't know if I wanted to laugh or cry more. I was working in an office where I sorted mail for hundreds of undergraduate college students living in dorms, and guess what the most popular item seemed to be? But after that, it was Netflix dvds, hehe. And Netflix envelopes were just big/small enough that they could be wedged into the boxes at an angle, but it made sorting and delivering quite the pain. Some of these oragami creations are kind of cute. Did you rent The Little Mermaid? 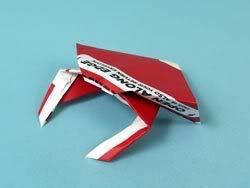 Netflixorgami recommends folding your own Sebastian the Crab to go with it. Want a tiny little snack tray for popcorn? 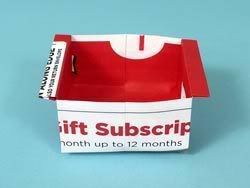 Use your Netflix envelope to create a box. 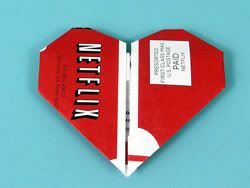 Or how about this....V-Day on a budget? Playing too much Frogger from Neave? 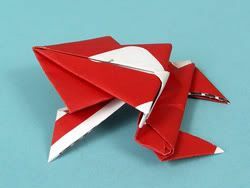 There are several other excuses and instructions for orgami to create when you're just plain bored.